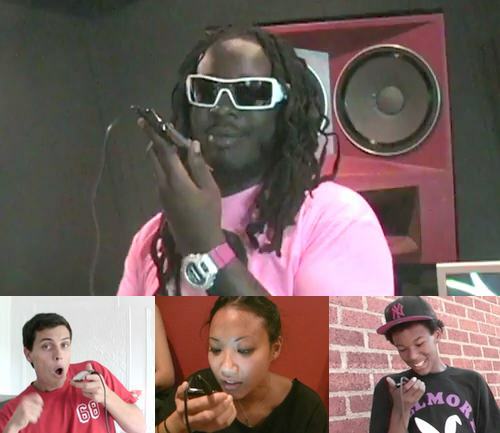 Buy U a Drank – I Am T-Pain – Auto-Tune iPhone App is an iPhone app that lets you have your own voice sounds Auto-tuned. Launch the I Am T-Pain app and step into the shoes of the famous hip-hop singer, songwriter, and producer. Select your favorite track. And just sing into the Mic on your iPhone. I Am T-Pain will record your new song. Video demo after the jump. You can also select the Freestyle option and use Auto-Tune for speaking or singing without companion tracks. Send your newly recorded songs to friends over email with a single tap. Or, simply publish your new songs on Facebook or Myspace (Smule will automatically archive your songs online for you and stream them to your site). Note that I Am T-Pain requires iPhone OS 3.0 and an iPhone, and is not currently available on the iPod touch. You can purchase the app here at itunes. Rumor: 32GB iPhone 3G, iPhone 2.5G and iPhone Nano?